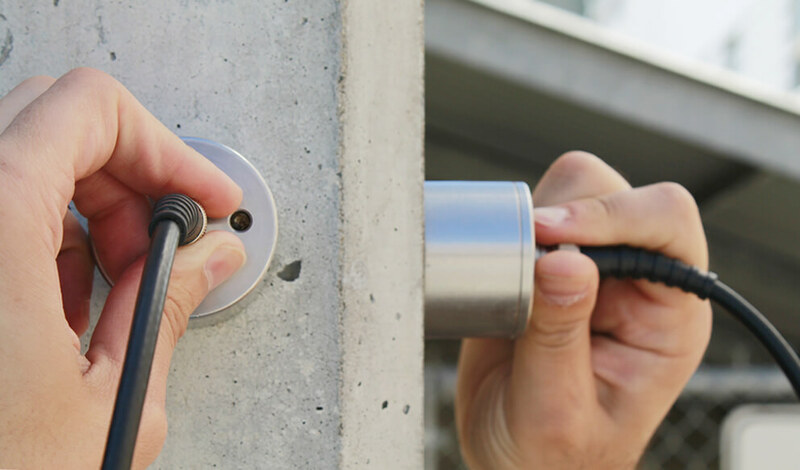 Ultrasonic Testing of Concrete - How it works? The concept behind the technology is measuring the travel time of acoustic waves in a medium, and correlating them to the elastic properties and density of the material. Travel time of ultrasonic waves reflects internal condition of test area. In general, for a given trajectory, higher travel time is correlated to low quality concrete with more anomalies and deficiencies, while lower travel time is correlated to high quality concrete with fewer anomalies. 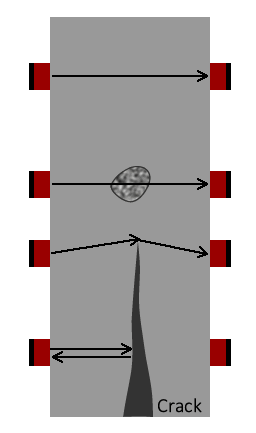 Once ultrasonic wave spreads within the test area, the wave is reflected in boundary of anomalies resulting in higher travel time. This results in higher transmission time (lower wave speeds) in poor quality concrete and lower transmission time (higher wave speed) in good quality concrete. Different configurations of transducers can be used to perform a UPV test. This includes direct transmission, semi-direct transmission, and indirect (surface) transmission. Figure above shows different configurations of transducer based on the access to the surface of test area. The ultrasonic velocity is prone to signal travel trajectory that is defined by the transducer configurations. Figure below is a representation of the effect of concrete anomalies and deficiencies on the acoustic wave travel time and the corresponding velocity throughout a given trajectory (ACI 228.2R, 2013). The UPV transducers must be in full contact with the concrete surface; otherwise the air pocket between the transducer and concrete may result in measurement error (i.e. inacurate measurement of transit time). One reason is that only negligible amount of wave energy will be transmitted in a poor contact. Different couplants can be used to eliminate air pockets and to assure good contact (e.g. petroleum jelly, grease, liquid soap, and kaolin-glycerol paste). It is recommended to make the couplant layer as thin as possible. This entry was posted in Inspection and Evaluation, NDT and tagged UPV. Bookmark the permalink. V. Good but need more precious because rejection & approval of concrete required solid evidence. Rejection and approval is normally done based on approved standard test procedure such as concrete cylinders and cores. When taking such samples is not possible, NDT methods can be used to study these structure. such cases will be existing structures with defects. coring and damaging will put structure integrity at risk. This is a very intreasting issue as NDT is very essential espcially for concrete repair, strengthening, and retrofitting, where the actual mechanical properties and residual strength is deeply needed. 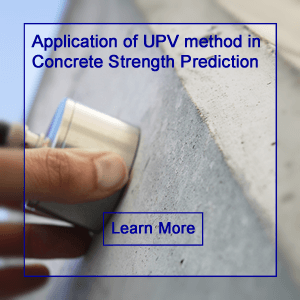 For concrete flaws, UPV is an excellent technique. But the UPV needs enhancements to get strong and higher confidence results espcially for strength values. Would you till us how to enhance the UPV results. It was great to read this testing method. Thanks for sharing this useful blog. A very well explained post, thanks for sharing. We know that Cold Joints perform poorly when transmitting the vibration energy generated by the machine. Do you have data about that? Dear all. The question is for my thesis, I want to know, if I have a set of signals recorded from UPV testing with a 54 kHz P trasducers, How can I perform a VELOCITY MAP of the concrete prism? DOES ULTRASOUND PASSES THROUGH COCONUT SHELL?